Turner and IMG’s ELEAGUE will enter the sports-action video game space for the first time to bring fans The ELEAGUE Cup: Rocket League, a feature series presented on TBS with live gameplay featured on Twitch and YouTube. The ELEAGUE Cup: Rocket League will showcase elite competition, while also shining the spotlight on engaging narratives surrounding teams, players and Rocket League®, the hit game that combines soccer with driving. The ELEAGUE Cup: Rocket League, created in partnership with independent video game developer and publisher PSYONIX, will begin Friday, Dec. 1, at 2 p.m. ET with a live invitational tournament on Twitch and YouTube. ELEAGUE will invite the world’s best eight teams – based on their performances at the elite level of pro competition – to play in The ELEAGUE Cup: Rocket League live tournament. In the spirit of international soccer competitions, two four-team groups will each play a round robin with the top two finishers from each group moving on to a single-elimination playoff. 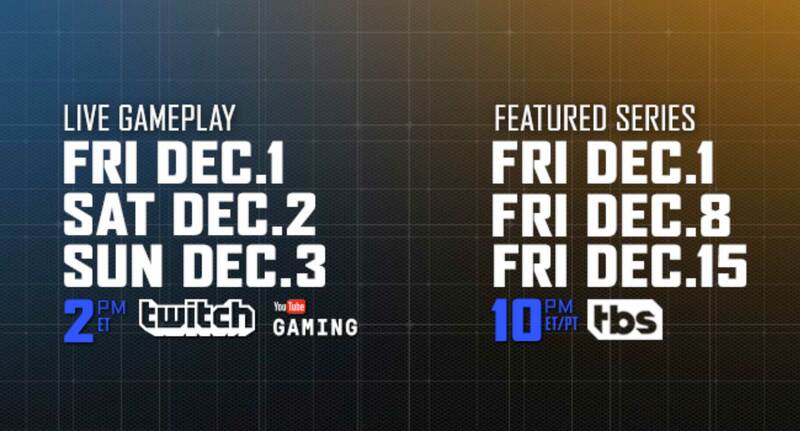 Live tournament coverage will continue Saturday, Dec. 2, and Sunday, Dec. 3, starting at 2 p.m. on Twitch and YouTube. Teams will compete live from ELEAGUE Arena at Turner Studios in Atlanta for $150,000 in prize money. TBS will also present a three-episode feature series documenting the game’s most accomplished teams and players as they compete at the highest level, including their journey through The ELEAGUE Cup: Rocket League. The series will premiere Friday, Dec. 1, at 10 p.m. ET/PT on TBS, with the second and third editions airing at the same time each of the following two Fridays (Dec. 8 and Dec. 15). ELEAGUE is the premium esports tournament and content brand formed in partnership between Turner and IMG that officially launched in 2016. A leader in the delivery of live event experiences, ELEAGUE content is regularly showcased on TBS and widely distributed across digital platforms including Twitch, YouTube and ELEAGUE.com. Over its first two years, ELEAGUE has produced and staged three season-long competitions featuring Counter-Strike: Global Offensive, along with the first-ever Overwatch® Open. As recognition of its industry-wide impact, ELEAGUE was awarded its first-ever CS:GO Major in January 2017. The ELEAGUE Major Grand Final set a new all-time Twitch record with more than one million concurrent streams, and a total reach of over 3.6 million viewers throughout the course of the event. ELEAGUE received a Sports Emmy® nomination for Outstanding Studio Design and Art Direction in March 2017. In August 2017, ELEAGUE made its first entry into feature-length premium episodic content with the launch of ELEAGUE | Road To The International Dota 2 Championships. ELEAGUE also actively engages with the amateur gaming community, including hosting the GEICO ELEAGUE Amateur Series. It is currently holding the ELEAGUE Injustice 2 World Championship, with the Championship round presented live tomorrow at 10 p.m. on TBS. ELEAGUE’s record-setting ELEAGUE Major in 2017 built momentum for the brand to receive a second CS:GO Major bid, with the ELEAGUE Major: Boston set for early 2018.